It sounds a little like a joke (and in a sense it is): Two US senators introduce a resolution based on fraudulent representations of reality, seeking to make the president insist that the Saudis bomb fewer civilians in Yemen, and this darkly hilarious hoax is still better than anything the other 98 senators (and the whole House) are doing about the US illegal war in Yemen. Our would-be heroic duo in the Senate doesn’t actually oppose the US war on Yemen, even though they acknowledge its savage daily violations of international law (currently suspended during a tenuous ceasefire). Regardless, these two senators are simultaneously misrepresenting US participation in those ruthless crimes (which the rest of the Senate simply ignores and the State Department trivializes). Following 15 years of special ops there, the US has been openly at war against Yemen for more than a year, in support of a genocidal Saudi coalition (mostly the Gulf Cooperation Council that President Obama met with privately recently). Once again, the US is in a war undertaken without Constitutional consultation with Congress, and without Congress raising a peep of an objection. This is a criminal war in which the US is at least accomplice to war crimes and crimes against humanity. The US drone war’s toll on civilians arguably makes the US guilty of committing both sets of crimes. 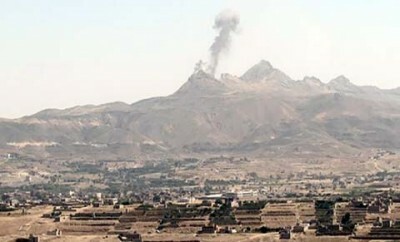 The same UN Panel of Experts cited in Resolution 32 also reported attacks on civilians by the Houthi-Saleh forces (usually referred to as the “rebels”) in Aden and Taiz, but the panel did not accuse the Houthi-Saleh forces of a systematic, countrywide campaign in violation of international humanitarian law. Yemen has been engulfed by civil war time and again in recent decades, but the current civil war is overwhelmed in brutality and carnage caused by the international aggression of the US/Saudi coalition. Theirs is the only bombing campaign in a largely defenseless country. The US/Saudi allies are responsible for most of the war’s 3000-plus civilian deaths and the destruction of at least three Doctors Without Borders hospitals among other atrocities. A major U.S. ally is in the crosshairs. The U.S. defense industry has sold at least $33 billion worth of weapons to its Persian Gulf allies over the past year as dual bombing campaigns against the Islamic State in Iraq and Syria and Houthi rebels in Yemen have depleted stores of aerial bombs and other munitions. But as civilian casualties mount in Yemen in particular, a bipartisan duo in the U.S. Senate is working to tighten the free-flow of weapons and cash between the U.S. and one of its most important Gulf allies. Sens. Chris Murphy (D-Conn.) and Rand Paul (R-Ky.) introduced legislation on Wednesday [April 13] that would restrict the sale of U.S. aerial bombs and missiles to Saudi Arabia unless certain conditions are met. Fortune has a funny way of seeing things: Saudi Arabia, without significant military risk, bombing civilians to the point of running out of bombs, is somehow seen as “in the crosshairs.” These so-called crosshairs are merely an empty threat by two senators to sell them fewer bombs. So long as the Saudis get the president to certify that they’ll bomb ISIS more, then everyone involved can go on about the business, the very lucrative business, of random killing as usual, even if the Saudis don’t bomb ISIS more. There is no purpose here beyond more killing, with little regard for who gets killed. Well, that’s pretty much a summary of the post-9/11 American zeitgeist, isn’t it? Is the United States capable of governing honestly about anything? Whereas the United States Armed Forces provide dedicated personnel and assets to the armed forces of Saudi Arabia to support their military operations in Yemen, including over 700 air-to-air refueling sorties, and to assist with effectiveness and reduction of collateral damage…. This is true as far as it goes, but it minimizes complicity: how much bombing would be possible without air-to-air refueling? The answer to that question would provide a measure of direct US responsibility for bombing at will in a country with no air defenses. The senators refer in deceitfully benign language to US personnel who “assist with effectiveness and reduction of collateral damage” the US/Saudi bombing raids. In reality, US personnel work side by side with Saudi counterparts in Riyadh, planning, authorizing, and assessing the bombing missions that began over a year ago and have produced a world-class humanitarian crisis. That result suggests that any effort to reduce collateral damage has been limited, incompetent, or both. But the senators also deceive by omission. Resolution 32 omits the moral (if not legal) war crime that the US commits every time it supplies the Saudi coalition with a cluster bomb, a devastating anti-personnel weapon, that leaves explosives littered around each bomb site, where they remain lethally dangerous, especially to children. That’s why most of the rest of the world has banned cluster bombs, while the US and other rogue states have not. Senators Murphy and Paul, like their 98 peers, lack the courage even to admit they’re on the wrong side of the law of war on this. And while the senators acknowledge “the systematic and widespread blockade” that has substantially deprived Yemen of food, fuel, medicine, humanitarian aid, and commercial goods, they omit any hint of US participation in that blockade by land, air, or sea. The US Navy in the Red Sea and the Indian Ocean reinforces the Saudi-dominated blockade. Yemen, the poorest country in the region, has long depended on food imports to feed its population of some 25 million. The result of the blockade, not unexpected, is that Yemen has been brought to the verge of mass starvation by the US/Saudi coalition. And the blockade further heightens the crisis by preventing Yemenis from leaving this nation-sized prison purgatory. An elaborate, meaningless charade is better than nothing, right? The US has been militarily engaged in Yemen since 2000, when suicide bombers attacked the US Navy destroyer Cole while refueling at port in Aden. The attack killed 17 crew members and wounded 39.US counter-terrorism operations in Yemen since then have included Special Forces, an extended drone campaign, and the current US/Saudi war. In that time, the al Qaeda presence in Yemen has increased to control much of the eastern part of the country, including the port of Mukalla, where Saudi battleships control access from the sea. As of April 23, Saudi coalition forces, including a large contingent from the United Arab Emirates, were massing for an attack on Mukalla, according to UAE official media. to prevent the United States from continuing to support Saudi-led military campaigns in places like Yemen where Saudi Arabia’s year-long campaign has led to a devastating humanitarian crisis and a security vacuum that has empowered our terrorist enemies al Qaeda and ISIS. The Murphy-Paul bipartisan legislation will require the President of the United States to formally certify that the Government of Saudi Arabia is demonstrating an ongoing effort to target terrorist groups, minimize harm to civilians, and facilitate humanitarian assistance before Congress can consider the sale or transfer of air-to-ground munitions to Saudi Arabia. We pay senators $174,000 a year (plus their perks and staff) and this is the best any of the hundred of them can suggest “to prevent the United States from continuing to support Saudi-led military campaigns in places like Yemen”? Seriously?